Zardi-e man az to - And take back my sickly pallor! 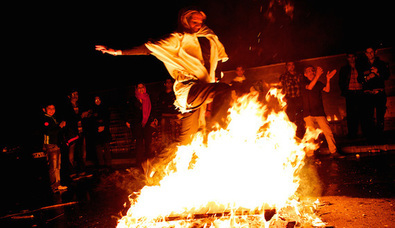 Chaharshanbe Suri reaches back to the ancient, pre-Islamic culture of Iran. The Encyclopaedia Iranica says it derives from the Zoroastrian festival of Hamaspathmaedaya to honor the souls of the departed, and no doubt reaches even further back to the widespread reverence of fire among Indo-European peoples, from the Vesta of the Romans to the Agni of the Indians. Thirteen centuries have passed since the Muslim conquest of Iran, five centuries since the imposition of Shia Islam by the Safavids, and near four decades since the Islamic Revolution of Ayatollah Khomeini. Islam is a universalistic ideology, like communism in the past, and big business globalism today, and as hostile to national identity as any. And yet, despite the recurring disapproval of the Islamic authorities over the long centuries, Iranians still hold fast to and revel in their ancient national culture. What an astonishing, enthralling fact this is! A piece in Al-Monitor from 2015 reports on the cat-and-mouse contest over Chaharshanbe Suri between the Islamic authorities, who issue prohibitions and strong warnings against marking the festival, and the people, who defiantly set off firecrackers and light bonfires.
" Mahdi argues that Chaharshanbe Suri is a ‘quiet political war between the clerics and the public: the more clerics reject the Iranian pre-Islamic traditions, the more Iranian public resort to their revival as a form of resistance. That is why you see an intensification of this practice as the Islamic Republic has progressed.’ "
The brief but widespread and explosive anti-regime uprising across Iran in January showed that anti-regime opposition is taking on the character of national resistance to an anti-national clerical regime in all its forms – ‘moderates,’ ‘reformers,’ ‘hard-liners,’ the whole lot. The uprising was sparked by rising economic hardship, driven by inflation, unemployment, falling living standards, and the looting of middle-class savings by fraudulent banks controlled by regime insiders. The crowds were quick to find the causes for their hardship in permanent features of the Islamic regime itself – its vast military expenditures to help spread the revolutionary Shi’ite ideology in other countries, for example, or the unbridled greed, corruption and unshakeable self-entitlement of the clerics and their offspring. No longer using the rights-based lexicon of votes and recounts, Iranians are instead demanding national dignity from a regime that for too long has subjugated Iranian-ness to its Shiite, revolutionary mission. It’s notable, for example, that protestors chant “We Will Die to Get Iran Back,” “Not Gaza, Not Lebanon, My Life Only for Iran,” and “Let Syria Be, Do Something for Me.” Put another way: The people are tired of paying the price for the regime’s efforts to remake the region in its own image and challenge U.S. “hegemony.” Some have even taken to chanting “Reza Shah, Bless Your Soul,” expressing gratitude and nostalgia for the Pahlavi era, which saw the modern, pro-Western nation-state of Iran emerge from the shambles of the Persian Empire. But much of the energy seems to be directed against the regime itself, and particularly against its hardline elements. The loudest slogan from crowds I watched on a rally livestreamed from a city in Western Iran was “marg bar Khamenei”—“Death to Khamenei.” That’s a twist on the famous “Death to America. Similarly, protesters in one video could be heard shouting “esteghlal, azadi, jomhouri Irani”—“Independence, Freedom, Iranian Republic,” an anti-regime adjustment of the 1979 revolution’s “Independence, Freedom, Islamic Republic.” That same video featured a darker slogan: “We are Iranian, we don’t worship Arabs”—a dig at the Islamic Republic’s elevation of an Arab-origin religion, sure, but also a reminder of the chauvinist streak in Iranian nationalism. The Supreme Leader Khamenei himself is not known to have personally stolen anything—he has his official palaces, after all. But his second son, Mojtaba, may have taken as much as $2 billion from the till, while his third son, Massoud, is making do with a mere 400- or 500-hundred million. His youngest son, Maitham, is not living in poverty either, with a couple of hundred million. The ayatollah’s two daughters, Bushra and Huda, each received de-facto dowries in the $100 million range….